Avail Now for Spring & Summer. Smack Dab on the Beach! 2 BR/2BA+Bunks! Books Up FAST! 'Smack Dab On The Beach' and Gulf-Front too!! Sunny Days-Rainy Days there's no place better than our “Beach Lover Paradise” Edgewater 811T2, located in Tower II on the eighth floor. The perfect place for your family vacation. Plenty of room for mom, dad, grandma and grandpa and the kids too! This condo has 1366 square feet of living space and 119 square foot balcony. It's your choice, sit out on the balcony or sit behind the glass front in the living room for the best views of the Gulf of Mexico. Get the sensation that should you keep walking in the living room, you might just step off into the Gulf. Comfortably sleeps up to 8, in two king-sized beds, a set of built in bunk beds for the kids, and a queen sleeper sofa. The master bedroom has a king-sized bed with adjoining bath with garden tub. The guest bedroom also has a king-sized bed with adjoining bath. Both bedrooms include 32' flat screen wall mounted cable TV. 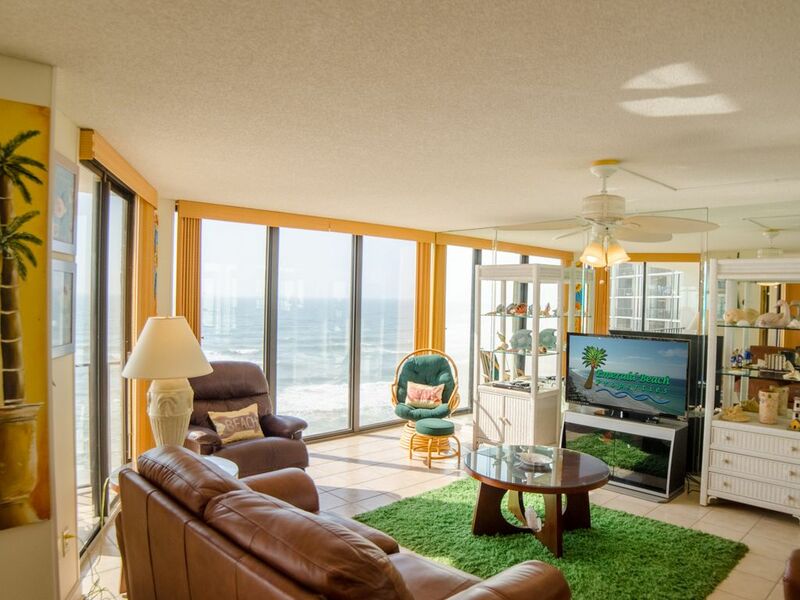 View the Gulf from the living room which includes a queen sleeper sofa and 50' screen TV. Built in bunk beds with twin mattresses in a separate room with a door. Bunk beds are for us kids only, please. The adjoining dining room seats six at the table and more seating at the bar. There is a sliding glass door onto the balcony from both living room and dining room. The kitchen is equipped with major appliances. There is a full-size washer and dryer. Linens are included. Free local and US long distance phone calls. Bring your computer and 'surf by the surf' with free high-speed internet access. Edgewater Beach and Golf Resort has the Amenities you are looking for!! The Polynesian-style Lagoon Pool is 11,500 square feet of pure pleasure, and there are four heated hot tubs around the pool and Gulf-side. Each Tower has its own private pool and hot tub, there are a total of 12 pools on the property. Additional amenities on site are available for an additional fee. The nine-hole, par three golf course is located near the Villas. There are 10 lighted Plexicushion tennis courts, and a complete pro-shop for equipment rental. The game room offers video games and there is volleyball on the beach. On-site services include Ocean's Bar & Grille beachfront restaurant that also offers room service and poolside dining, pizza shop, poolside bar and Edgie's beach store with Starbucks and ice cream. The resort also offers a hair salon, gift shop, health spa, massage therapy and free tram service for the entire complex. The 9-hole, par 3 golf course and tennis courts are located across the sky bridge. Contact the resort for information on pricing and availability. Everything you need is nearby or onsite! Edgewater Beach Resort offers guests the most amenities of any resort in Panama City Beach, there's something for everyone! Why choose one of our luxury properties managed on behalf of the owner? We offer the advantages of a full service management company and vacation rental from an owner who takes pride in their property. We're here in Panama City Beach, with a local front desk and local staff on call 24 hours a day, 7 days a week! Your vacation rental is professionally managed from start to finish. We are licensed, bonded and insured. We use state of the art technology to deliver secure booking and payments, and quick responses to your inquiries. Management, maintenance, rental services, and housekeeping are all just a phone call, text or email away! Your vacation rental is professionally cleaned and maintained. Housekeeping is managed by our staff, and all properties are double-inspected for quality assurance. Linens are professionally laundered and ironed, we use quality cleaning supplies and high temperature steam mops. We use ecofriendly cleaning practices that help preserve the earth's precious resources while providing our guests the cleanest properties around! Our maintenance crew keeps all properties in top shape. We give you peace of mind with our state of the art door lock system. Lock codes change with each rental. You can choose your own personal door code, too! All units are equipped with deadbolts in addition to the entry locksets. No more worrying about who else has access to your vacation rental! Delivering the very best vacation experience to you is our number one priority! You can book with confidence knowing we'll make Panama City Beach your Perfect Place in Paradise! Emerald Beach Properties specializes in representing our owner's properties individually and managing them like they are our own. You can choose from many different properties located in many different resorts. Let us help you find your prefect place in Panama City Beach, Florida. Why choose a luxury property managed by Emerald Beach Properties on behalf of the owner? We offer the advantages of a full service management company and vacation rental from an owner who takes pride in their property. We're here in Panama City Beach, with a local front desk and local staff on call 24 hours a day, 7 days a week! You vacation rental is professionally managed from start to finish. We are licensed, bonded and insured and all of our employees wear company ID badges for added security. We use state of the art technology to deliver secure booking and payments and quick responses to all your inquiries. Management, maintenance, rental services and housekeeping are all just a phone call or email away. Your vacation rental is professionally cleaned and maintained to our Emerald Quality Certified Vacation Rental Standards. Housekeeping is managed by our staff, all properties are double-inspected for quality assurance. Linens are professionally laundered and ironed, we use quality cleaning supplies and high temperature steam mops. We use eco-friendly cleaning practices that help preserve the earth's precious resources while providing our guests the cleanest properties around! Our maintenance crew keeps all the properties we manage in top shape. Emerald Beach Properties gives you peace of mind with our state of the art door lock system. Lock codes change with each rental. You can choose your personal door code, too. All units are equipped with deadbolts in addition to the entry locksets. No more worrying about who else has access to your vacation rental! Delivering the very best vacation experience to you is our number one priority! With Emerald Beach Properties, you can book with confidence knowing we'll make Panama City Beach your Perfect Place in Paradise. See you at THE BEACH! toilet, shower, Beautifully updated and modern bathroom! (3) cordless phone with digital answering machine. Dryer in unit. Iron and ironing board also provided. You'll find everything you need in our gourmet kitchen. Located in health club at an extra charge. Edgewater Beach Resort is the ONLY full service resort in Panama City Beach. On site restaurants: Ocean's Bar & Grill, Pizza Hut, Edgie's Corner Market serving Starbucks coffee and Ice Cream, Binimi Sand Bar. On site gift shop, beauty salon, health club, massage therapy. 9 Hole Golf Course on property. Tram service to all amenities on property. Beach chair rentals, jet ski rentals, parasailing, beach volleyball, game room, 12 lighted tennis courts-6 with plexi-pave and 6 with plexi-cushion surfaces. There's no other property like this on the beach! The room was very nice. The only complaint we had is that one of the beds was not very comfortable. This condo was amazing!! We arrived to a clean and inviting space. The decor was fun and beachy!! We slept great in all the beds and my 6 year old son loved the bunk room!! But the view is what it's all about!! It literally feels like you are on the water!! The balcony is great as well!! The amenities of this resort are wonderful and convenient. Oceans restaurant has excellent food the pizza place has awesome pizza. I highly recommend to anyone to this condo and resort!! The property is perfectly located and the views are incredible. Everything you need to have a great visit ! The unit really wasn’t clean upon arrival and the rental office was very generous in offering to send a crew back over but we had already unpacked and honestly didn’t want the inconvenience of moving our “stuff” around ... anyone wanting to have a great beach vacation should consider this unit as it is what the beach is all about !! Thank you for your review and staying with Emerald Beach Properties. We are sorry for the housekeeping issues. We are glad you had a great time and looking forward to your return. Nice clean rental, beachfront view was great. Excellent stay. Thank you for your review! We are glad you had a great time! Looking forward to you staying with us again! Great condo that had everything we needed with an amazing view! Condo was very clean. We stayed with another family and had plenty of room. The kids (10 yr olds) loved the bunk room!! We would definitely stay again. The restaurant at the resort had great food, we ate there a few times. Movie night at the pool was a lot of fun too. Great location & nice condo; however, we were disappointed in the lack of kitchen items (pots, pans, etc). The TV didn't work in one of the bedrooms & the microwave didn't work & we weren't notified of this. The Wi-Fi was terrible & we actually had to call the 800# to have somebody look at it & it still didn't work after he left. The third bedroom is not an actual bedroom, it's a closet with a bunk bed in it so we were disappointed in that as well. And when we first arrived on check in day at 4pm to get into the condo, they were still cleaning it so we had to stand outside & wait for about 30 minutes until they finished. A text or call would have been appreciated. Edgewater Beach Resort is conveniently located near many exciting vacation activities like Dolphin Encounter Tours, State Parks, Shopping at Pier Park and other specialty boutiques, Ripley's Believe It Or Not Museum, Charter Deep Sea Fishing Trips, Shipwreck Island Waterpark, Zoo World, Rock'it Lanes Bowling, Gulf World, Movie Theatres, Mini-golf, Bungee rides, Go-Kart racing, the Sea Screamer and Pirate Ship excursions, great restaurants and much more! There's plenty to do in Panama City Beach and less than an hour's drive away is the Silver Sands Factory Outlets near Destin and the Ebro Dog Track, Poker room and Simulcast.